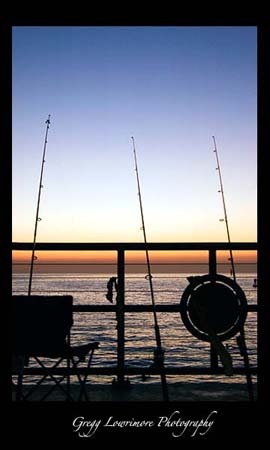 Here’s an image I caught at the Redondo Beach Pier last October while walking out to have dinner at Tony’s Fish Market. Depth of field on this image is too shallow to make any print larger than an 8×10, but I like the composition and the colors of the sunset. Posted in Shoots and tagged Redondo Beach Pier by greggl with no comments yet. 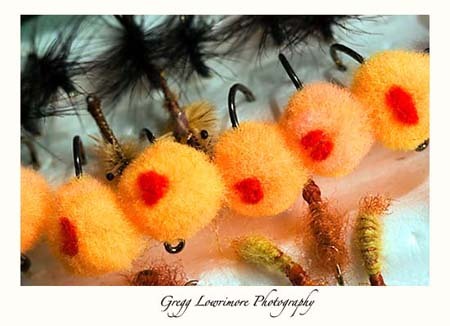 The popular egg pattern fly. Simple composition, simple lighting. Working on the depth of field though. Posted in Shoots by greggl with no comments yet. 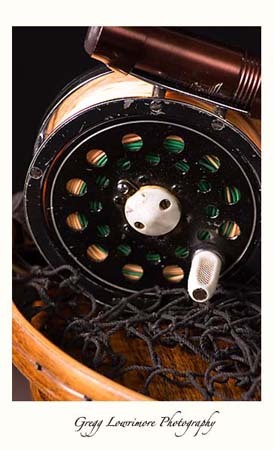 The stories this fly rod and reel and net could tell…. I’ve been meaning to start photographing my other favorite pass time: fly fishing, for a long while now. So the other night I setup my Photogenic lights and my home-made PVC-based light panel with my newly acquired remote wireless triggers (more to come on these in another post), and started digging out some of my old fly fishing antiquities. This was shot in my studio, with the D100, 80-200 non-AFS lens and the Kenko Pro Extension tubes. What do you think of this shot?. Posted in Shoots and tagged remote wireless by greggl with no comments yet.